Still the public events flow and this month we had the Red Centre NATS in Alice Springs which was a great success with huge numbers in attendance. As we all know there was an unfortunate accident that injured a number of bystanders and all measures are underway to ensure this does not happen again. For St John this was a major medical event involving some 5 operational crews, on the ground Intensive Care Paramedics and Volunteer crews. Our people did a remarkable job and again highlighted why a joint St John Paramedic and Volunteer delivery model works best. Well done to all involved and the thanks and support, for all that we did on the day, from the Chief Minister to the general public has been outstanding. As a follow-up to this event on 25 October we held a CEO Commendation ceremony in Alice Springs with the Health Minister there speak on behalf of Government and to assist with the awarding of the commendation certificates for everyone involved. It was a great day and attracted media from the Centralian Advocate and ABC Radio/television. We hosted a great morning tea for R U OK Day during the month and everyone was asked to bring along a plate of food of their choice. The amount and variation of food that we all brought along and consumed was amazing and we were still eating some of it the next day. It was for a great cause and what we learnt was that there doesn’t have to be a special day when we ask R U OK but that it can be any given day when your work colleagues may need a bit of support. We also celebrated World First Aid Day with some free CPR and First Aid training demonstrations held at both the Anula and Alawa Schools. This year was a small affair which we believe we can work on to make bigger and better next year. On 26 October we celebrated training our 50,000th student under the St John NT First Aid in Schools Program by running a training session for primary school aged students at Anula School. It was another great celebration for us and the students and the school really appreciated the free first aid kit we provided to them all for being a part of this major event. Again we attracted good media from the NT News and Channel 9. On 31 October the NT celebrated the appointment of our 22nd Administrator with Mrs Vicki O’Halloran being inducted by the Governor General at Parliament House. In her role as Administrator she is requested to become the St John Ambulance NT Deputy Prior (NT’s most senior representative of St John NT), which she has graciously accepted. A ceremony to induct Mrs O’Halloran into the role of Deputy Prior took place immediately following her induction as Administrator at Government House under the instruction of the Governor General. This was a memorable ceremony MC’d by our Chancellor, Professor Mark Crompton, and attended by many Members of the Order and St John Ambulance NT Board and staff. Mr Craig O’Halloran, by virtue of the Administrators appointment as St John NT Deputy Prior, also becomes the Patron for St John Ambulance NT. We welcome them both to their new roles within St John NT. Please check out all the articles in this extended edition but importantly the events we held around restart a heart day (16 October) and Mental Health Week (9-13 October). These were both significant events well celebrated. On a more personal note this will be one of my last newsletter articles in my role as CEO of St John Ambulance NT. After 24 years with the Organisation (the last 9 as CEO) it is time for me to make a change and with this in mind I have resigned with my last day being December 15 this year. It has been an incredible journey for me during which I have seen a great deal of change, met some amazing personalities and realised many of my dreams as a worker and leader in the Ambulance and Not for Profit Sectors. I thank you all for your support of both myself and this fantastic Organisation, St John Ambulance NT. I trust you enjoy this month’s combined edition and remember only 8 weeks to Christmas! St John Ambulance NT paramedics and volunteers spent an enjoyable morning at Anula Primary School this October amongst students and teachers, where they marked the incredible milestone of 50,000 school aged children receiving FREE first aid training across the Territory. This training was part of the St John Ambulance NT First Aid in Schools Program which began in 2013. Anula students learnt valuable skills needed to save a life in an emergency, plus were given a first aid kit of their very own to take home and keep. St John Ambulance NT would like to thank the students and everyone involved in celebrating this achievement and look forward to reaching the 100,000 mark in the future. St John Ambulance NT paramedics and volunteers spent an enjoyable morning at Anula Primary School this October amongst students and teachers, where they marked the incredible milestone of 50,000 school aged children receiving FREE first aid training across the Territory. This training was part of the St John Ambulance NT First Aid in Schools Program which began in 2013. Anula students learnt valuable skills needed to save a life in an emergency, plus were given a first aid kit of their very own to take home and keep. St John Ambulance NT would like to thank the students and everyone involved in celebrating this achievement and look forward to reaching the 100,000 mark in the future. A CEO Commendation Ceremony was held in Alice Springs this October, as a special opportunity to thank and recognise all the remarkable efforts of St John Ambulance crews and volunteers on a traumatic day earlier this year. On Sunday 3rd September, a flash fire during a burnout competition at the Alice Springs Inland Dragway resulted in 12 spectators receiving serious injuries. The scene was immediately attended to by St John Ambulance paramedic and volunteer crews, providing urgent assistance and transporting the injured to Alice Springs hospital. Chief Minister Michael Gunner visited the Alice Springs ambulance station in early September to extend his personal thanks to the crews and volunteers, applauding their rapid and effective response to this crisis. The Ceremony was attended by Minister for Health Ms Natasha Fyles MLA, who personally thanked the crews and volunteers who were immediately on the scene to provide care and clinical intervention in what was a major medical event. The incredible work of the crews that day highlighted the effectiveness of a joint St John Paramedic and volunteer delivery model. Currently only 1 in 10 survives a cardiac arrest, and we at St John Ambulance NT think we can beat that! So for Restart a Heart Day this October, on the lawns at the Darwin Waterfront and inside the Yeperenye shopping Centre in Alice Springs, St John Ambulance NT provided free lifesaving CPR and AED training to all. The Australian and New Zealand Restart a Heart Day was an exciting and crucial opportunity to highlight the importance of CPR training and AED use in local communities in an effort to significantly increase survival rates from out of hospital cardiac arrest. Three little words that could save a person’s life. The Mental health and wellbeing of our Territorians is crucial, and in recognition of this, St John Ambulance NT joined in R U OK day on 14th September, visiting centres out and about across the Northern Territory such as Katherine and Nhulunbuy to ask communities – R U OK? Suicide prevention is an incredibly complex and sensitive challenge worldwide. 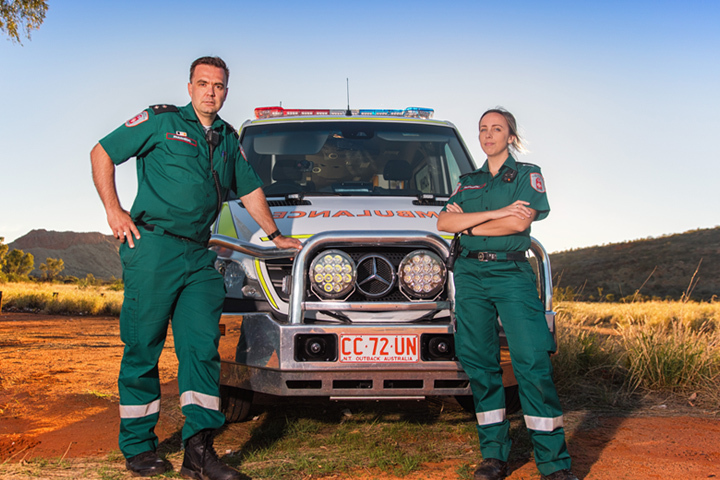 The paramedic crews and volunteers from St John Ambulance NT this year really helped to encourage support for one another in our work places and homes, giving people the ability to recognise if someone around them is suffering in silence and needs help. For more information on where to go to get support or how to ask the question ‘R U OK?’ please visit www.ruok.org.au. With mental health issues becoming more and more common, first aiders at work and at home are now being called to help with conditions related to the mind. One in 5 Australians experience a mental health condition in a given year and almost one in 2 will experience a mental health condition at some point in their lifetime; yet many do not seek treatment. NT Mental Health Week 8th – 15th October sought to highlight these issues and raise awareness of the mental health challenges faced by people on a daily basis. As part of this important week, St John Ambulance NT held a free First Aid for the Mind, 2 day training workshop, at 50 Dripstone Road, Casuarina. Mental health issues can be difficult to recognise and frightening to deal with. First Aid for the Mind courses focus on mental health issues in everyday situations and how early recognition and intervention can be key to effectively assisting in mental health emergencies. To book a place on a First Aid for the Mind course just click here. The huge importance of First Aid training in saving lives and preventing injury was globally recognised on 9th September with a World First Aid Day. St John Ambulance Australia believes far more people should be trained, equipped and ready to confidently provide First Aid skills in an emergency situation, so to promote this day paramedics and volunteers hit the streets to give free CPR training and demonstrations. A free 30min CPR training session was held at Casuarina CPR and First Aid Demonstrations were made available at the Alawa and Anula School Fairs, as well as a 15% discount made available on all first aid training. To show just how first aid training can save a life, St John Ambulance Australia gave a special World First Aid Day CPR demonstration on the TODAY show. Watch it again here. In September St John Ambulance paramedics attended the scene of a serious accident at the popular Katherine tourist attraction, the Hot Springs where a New Zealand backpacker was in need of rapid medical assistance. A holidaying nurse helped to keep the man alive after he apparently slipped and fell from a tree above the springs’ top pool just before 6pm. Emergency services then floated the unconscious man on a stretcher down the springs due to the steep banks. Katherine St John Ambulance paramedics guided the stretcher though the water until they could lift him out safely. St John Ambulance officer in charge at Katherine, Rhys Dowell, was in the water with the injured man until he could be flown to Royal Darwin Hospital.